Halloween can be a very dangerous and stressful time for critters. Here are my seven favorite ways to help protect dogs and cats from ghosts, goblins and things that go bump in the night. I hope you’ll forward them to friends and family so everyone can stay safe. Tip 1) Check Out Those Costumes. Some dogs (and maybe two cats) enjoy playing dress-up, but many others are devout nudists. Remember: fun for you can be misery for us. If you do insist we play dress-up, ensure that fabrics are fire-retardant, non-toxic and free of anything your sweetie can chew off and swallow. Even a pompom can prove deadly when lodged in the throat or intestines. Make certain, too, that costumes are comfortable, don’t chafe, and won’t obstruct vision or cause your little darling to panic and run. Tip 2) No Candy for Fido and Fluffy! Secure Trick-or-Treat bowls of candy out of the reach of pets, and don’t allow pets to play near kids picking through their Halloween bounty — especially if it’s spread out on the floor. Chocolate, macadamia nuts, treats sweetened with the artificial sweetener Xylitol, and even grapes, raisins and apple seeds can be toxic—even deadly. And too much sugar is as harmful to pets as it is for kids. Note: If you assemble a Halloween goody bag for your pets, remember: no chicken jerky (or anything else) from China! Make sure all ingredients are of US origin. Treats, like cars, can be assembled in the USA, be labeled Made in the USA, but still contain ingredients from other countries. (You just can’t trust Humans, can you?) Check with the manufacturer to make sure they’re safe. Tip 3) Prevent Runaways. While you’re handing out goodies, your pet can panic and dart out the door and become injured or lost. (If you doubt it, just ask emergency clinic vets and shelter managers how often this happens.) Secure all pets carefully before festivities begin. Since clever animals may escape despite your best efforts, attach current tags. For added safety, engrave tags with a cell phone number and the word “Reward” instead of the pet’s name. Tip 4) Watch Out for Pranksters. Are you going out trick-or-treating? Leave nervous and aggressive pets at home and bring “outside” pets indoors to prevent mayhem and theft. Carousing demons may enjoy painting your cat black or mummy-wrapping your dog, and your tormented or injured pet may bite back (hello lawsuit!) or dash into the street and under the wheels of a passing car. Tip 5) Outshine the Dark. If Fido tags along for Trick-or-Treat fun, make him easily visible with a dog-safe light or strobe or reflective tape attached to his collar or harness. Better yet, get him a reflective vest. Tip 6) Beware Deadly Decorations. 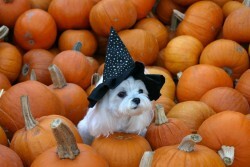 Candles, even inside a pumpkin, can attract a curious pet and cause painful burns. Be especially wary if your dog or cat plays lookout at the window near a lit Jack O’Lantern. Also be wary of decorations that may prove toxic or scary. Those fake spider webs can be especially dangerous if swallowed. Make Halloween safe and fun for your dog or cat by anticipating and outwitting danger. Whether the festivities are a trick or a treat for us pets, and by extension for our families, is largely up to you and the steps you take before and after the fun begins. Have a happy, safe Halloween. Boo! Want to see something really scary? Tear stains! More than 400 people have taken our tear stain questionnaire. Have you?